The Internet has opened investing up to just about anyone. It’s possible for just about anyone with $25 and a computer to begin investing. However, before you can start investing, you need to find a broker to work with. The good news is that there are plenty of online brokers out there that can help you find investments to build your portfolio. 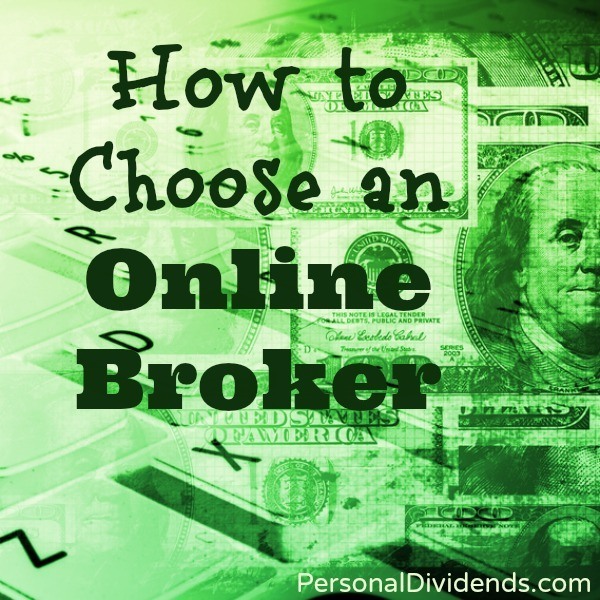 Here’s how to choose an online broker. Which Broker Should You Choose? When deciding on an online broker, you need to make sure that you understand the purpose of your investment account. If you are looking for a way to build a nest egg for retirement, and you just want to buy shares of an index fund or ETF, setting up an automatic investment plan using dollar cost averaging, then almost any discount broker will do. However, if you want to trade frequently, and you want more advanced options, you will have to be more specific about what you look for. Decide whether you are trying for growth, or whether you want to be able to invest in commodities or currencies, or if trading options is of interest to you. Once you have crystalized your purposes for investing, you can start looking for an online discount broker that suits your needs. Opening balance: Some brokers require no opening balance, although $25 is a fairly common requirement. In other cases, though, you might be required to open with $100 or $1,000 — or more. Minimum balance: This is a fairly rare requirement. Most discount brokers won’t require you to have a minimum amount in your investment account. However, some do, so make sure you check for this requirement. Account fees: Try to avoid brokers that charge account fees. These are maintenance fees, annual fees, or fees charged when you don’t meet a minimum. Transaction fees: All brokers charged transaction fees. When you are trading stocks, many brokers charge a flat fee for each trade. Options usually come with a flat trade fee, plus a per-contract charge. Mutual fund trades generally have higher fees, but some brokers will let you invest in certain funds for free. Research and tools: It’s also a good idea to look at what research the broker offers, as well as the trading tools provided. You might be able to find information about stocks you want to purchase, as well as use a stock screener to find potential investments. Find out what educational resources, real time quotes, and up-to-date research and news the broker offers. Customer service: Research customer service. Some brokers have free online chats that can help you with your problems. You also want to be able to reach someone if something goes wrong with your trade. Be aware, though, that if you use the phone to get help from a broker in placing your trade, you might be charged more. In the end, only you know which broker works best for you. Now that you know how to choose an online broker, do your research, and go with the broker that you think will best fit your needs.